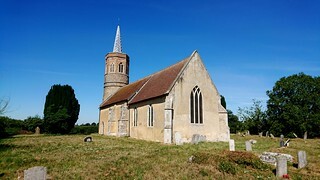 From the little redundant church at Frenze on the outskirts of Diss it is not much more than a mile in a straight line across the fields to Shimpling church, but in the furnace-heat of this early August day it took three miles of cycling along doglegging lanes for me to reach it. These are very lonely lanes, protected from the A140 and any through traffic intending on reaching Diss any time soon. I don't think I passed a single car, and the only people I saw were a couple of walkers, a man and woman with rucksacks and staves. We said hello, and I headed past never expecting to see them again. Eventually I reached the track down to Shimpling church and freewheeled down to the churchyard, and as I opened the gate the walkers came up beside the hedge, to meet me, having trudged across the fields. They were very nice, both with that slight air of hippydom which they had obviously acquired at the time in the sixties and never lost, something perhaps easier to maintain in rural East Anglia than in some big city. They lived locally, and like me had just come from Frenze church. They sat in the churchyard to rest, and I went inside. I remembered the first time I'd come this way, in early 2005 on a day of sub-zero temperatures, snow on the ground and more snow to come. That day, it seemed a silent, frozen space, remote from any century as much as from any place. 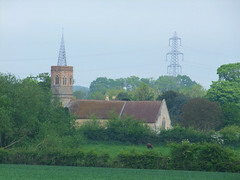 And yet the tower of St George is a familiar sight to drivers between Ipswich and Norwich, off in the fields near Dickleburgh. 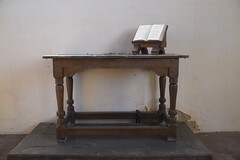 A substantial, landmark church then, but it may surprise you to learn that it is redundant. Shimpling's redundancy seems careless. 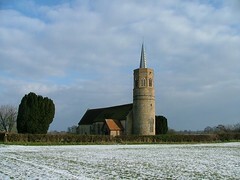 Unlike Frenze church, which has just a farmhouse for company, St George does not sit in a a tiny village, and if drawn into a group with Dickleburgh could surely have sustained a monthly service or so. 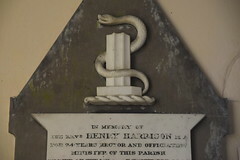 Probably, if it arose nowadays, St George would not be declared redundant. 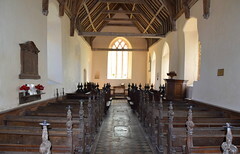 From the point of view of the building, of course, it was both a blessing and a mercy, for as at nearby Frenze the church is now in the capable, caring hands of the Churches Conservation Trust where it was previously prey to neglect. For many years this church has been kept locked, and you had to go and get a key for it. I had found this a frustrating experience, for on three occasions I had found the keyholder out. 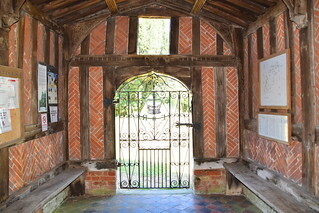 Nowadays the church is open every day, although the 'church open' sign, which in this case might have been useful out on the track, was cunningly concealed in the porch. Maybe the CCT are still a bit wary, but a notice on the board told me that if I found the church difficult to access I should call the CCT office in Cambridge, something I hadn't seen before. 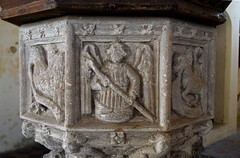 We are not very far from the border after all, and St George is perhaps more typical of Suffolk than Norfolk, a small, rural church made opulent by the wealth of the later years of the 15th century. 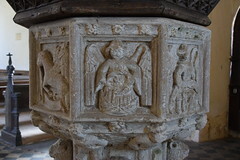 It was then that the font came, and the benches, the roof, the surviving scattering of medieval angel glass. Otherwise, the feeling is of the much-maligned Victorians, who loved churches and wanted this one restored to its former glory. 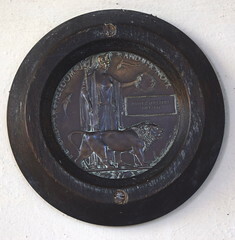 Geoffrey Millard, rector through those times, has his memorial in the chancel, but all around it is the building that he would recognise instantly if he stepped into it today. 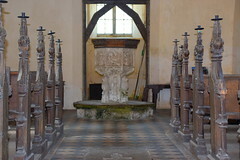 The font is a very good and typical example of the late medieval East Anglian style. 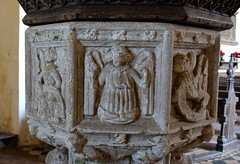 On the panels, the symbols of the four evangelists are interspersed with four angels holding the Instruments of the Passion, a crown of thorns, a ladder, a lance, and what was probably three nails. Amber light fills the space beneath the tower, and I was glad I was here again, in this silent space, this touchstone to the long generations. There are curiosities: under the benches at the west end, there is a trap door. Underneath, some of the original medieval tiles have survived the Victorians, who merely built a wooden platform over them. 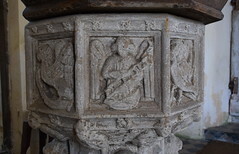 Then, a wholly secular brass inscription of 1598 to Anthony le Grys is set in the middle of the nave - but the inlay is the wrong size and shape, and so it may have come originally from somewhere else. Or was the original stolen and this replacement hastily prepared in later, less articulate times, perhaps the middle of the 17th Century? It struck me coming back that Anthony le Grys was probably a child. 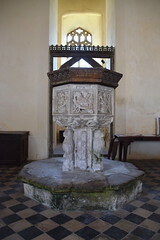 A small hole in the north wall of the sanctuary is surely too tiny to have been an aumbry. 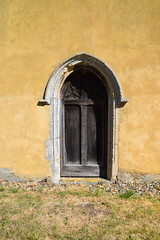 And yet, it is set back to take a door, and appears once to have had some sort of wooden tympanum set over it. 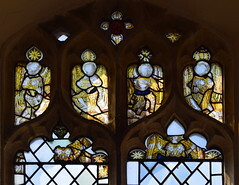 Could it have been a squint from a shrine chapel? 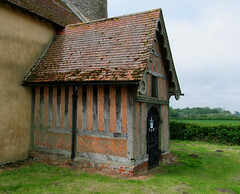 Or even from an anchorite's cell? 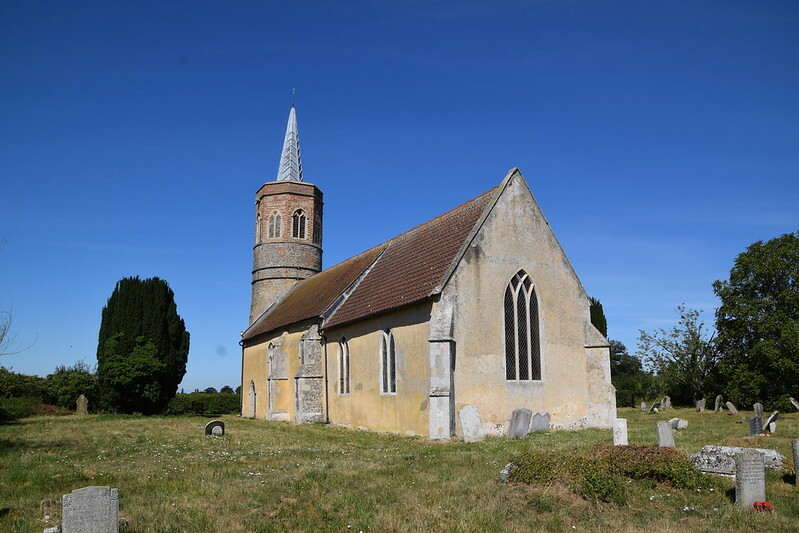 Incidentally, another curious thing: There is a Shimpling in Suffolk as well, and the churches of both are dedicated to St George, an otherwise unusual East Anglian dedication. 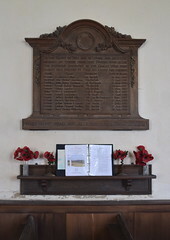 The reason appears to be that the enthusiastic 18th century antiquarians, ruttling around in the Diocesan records at Norwich, accidentally applied the dedication of the Suffolk church to both, dedications having fallen out of use for two hundred years or more and it no longer being clear which was correct.